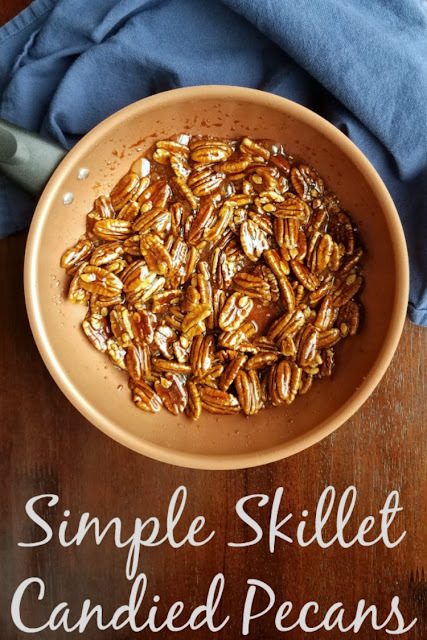 Candied pecans made quickly in a skillet on the top of the stove are simple way to elevate so many dishes. They are great on their own too! 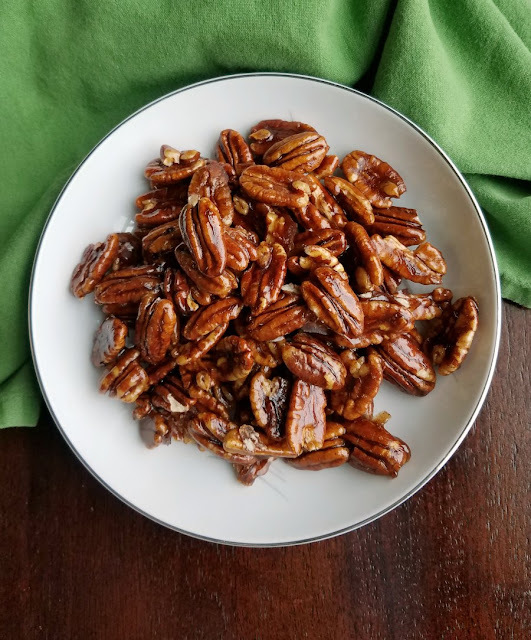 Candied pecans are the perfect little something to take so many recipes to the next level. They are great in salads, or eaten on their own as a delicious snack. Want to give your dessert that little extra something? 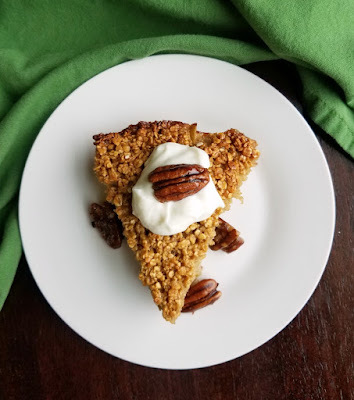 Perch a candied pecan on top of the whipped cream. The best part is how easy they are to make. Pretty much any way you decide to make them, there isn't a ton of effort involved. But that doesn't have to stop you from making these delicious sweet morsels of goodness. You can do it in a skillet on top of the stove instead! This time of year I especially like to have candied nuts, there is just always something to put them on. Plus I tend to snack away any left from a batch after using them once, so I keep having to make more every time I want some. 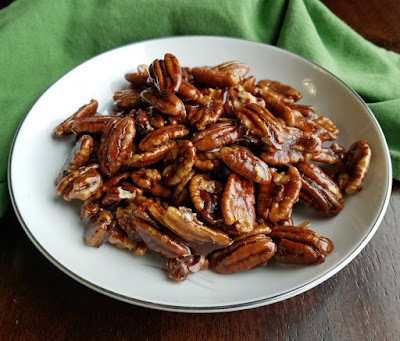 So I thought I would share with you two very simple ways to make candied pecans. 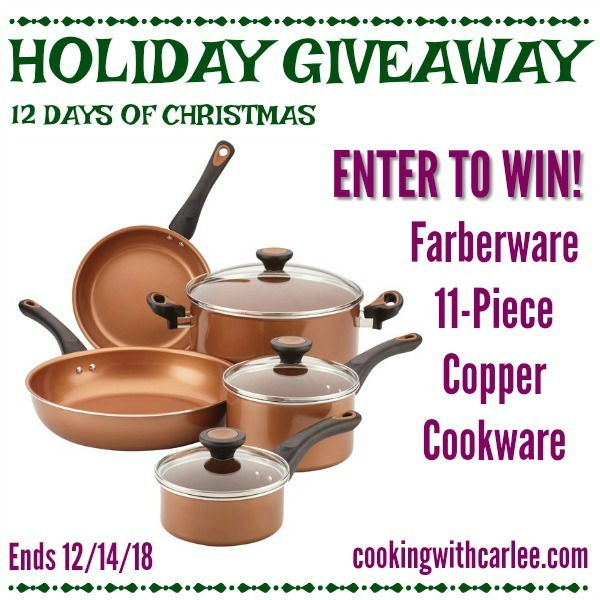 To make the job even easier, Farberware sent me this beautiful set of copper ceramic cookware. It made making the nuts and washing the dishes even easier. I am sharing with you two ways to make them, because they each have their merits. The recipes are basically the same except one small but crucial difference. 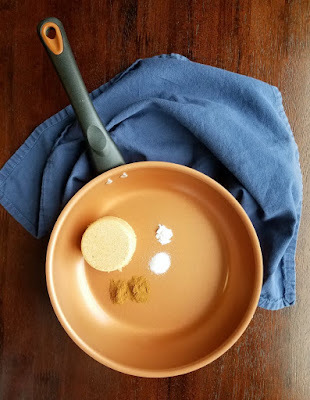 The first batch I made was with a simple caramel made from brown sugar, salt and a bit of cinnamon to give it that fall spice. They were delicious and shiny and perfect when placed on some vanilla yogurt topping some apple pie baked oatmeal. They would also be great in the red, white and blue dinner salad or apple dinner salad. They were shiny and beautiful and really tasty. I would almost be ashamed to tell you that I ate darn near the whole batch by myself, but they were too good to feel bad about it! Though the caramel set and they were perfect for garnishing desserts, the caramel remained a bit softer than I had envisioned. So I did a second batch using a trick I learned from making caramel corn, baking soda! Adding the baking soda helps you to get that crunch! The results of that batch were also amazingly delicious. They definitely lost their luster but would also hold up better if packed in baggies to give as favors or for longer term storage. They are a lot less likely to stick to each other over time! In trade for the crisper coating, you definitely loose the luster. So it is up to you which way you decide to go. Or do what I did and make some of each, then maybe some of each again. You know, for science and being thorough and all that good stuff! Work quickly when spreading the candied nuts out on parchment paper. They cook quickly and will stick together if not spread out. Feel free to play with the flavors. I love a spicier candied nut in salads, just a pinch of cayenne can really change the whole experience! Feel free to try other nuts or even mixed nuts! In a large skillet, heat brown sugar, salt, cinnamon and water over medium heat until it is really hot and bubbly. Add the pecans and cook, stirring frequently for about 3 minutes. 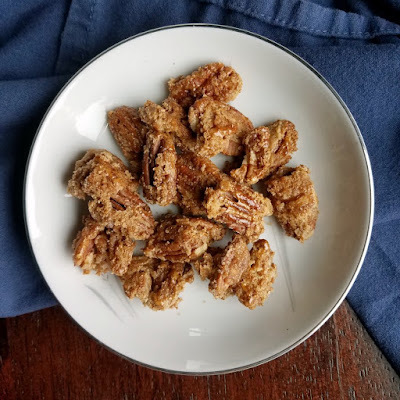 If you desire the crispy finish, quickly sprinkle baking soda over pecans while stirring. 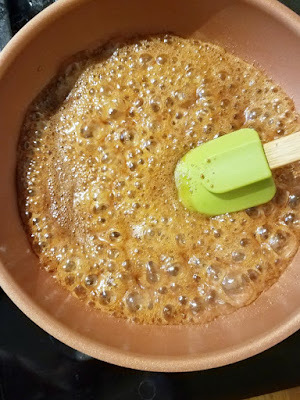 It should quickly go from a lustrous caramel to a crunchy candy coating. Spread hot candied pecans over a piece of parchment paper, working quickly to get them spread out. Cool completely and then store in an airtight container until ready to use. I'd happily receive some! Thanks! For potlucks, my go to is my Layered Berry Salad that should be appearing on my blog soon! I love this recipe. 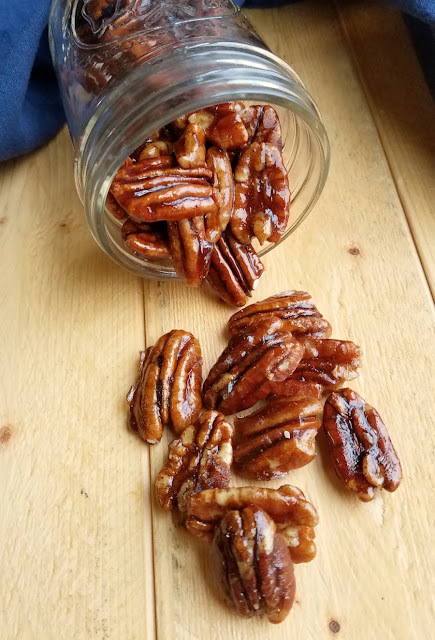 Candied pecans are so good. Thank you for sharing. 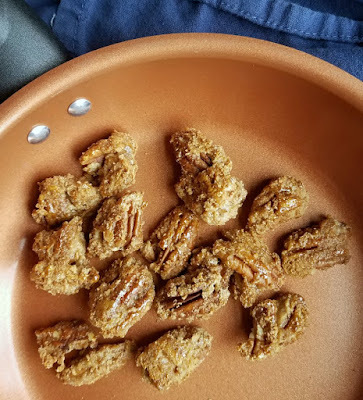 I love pecans but have never made candied pecans before. I'm going to have to add these to my Christmas goodies list! I am so glad to see you enjoyed them! Thank you, Val!